Who said you can't have sharks in your backyard? This awesome package will definitely bring that WOW! factor to your party or event. There is no better way to cool down on a hot day than sliding down on the shark water slide and splashing at the pool that features an inflated bottom for a safe landing. Have you ever dreamed about jumping into a shark's mouth? Run as fast as you can and do it! you will slide 30' before you make the big splash at the end of the Big Bite slip and slide. 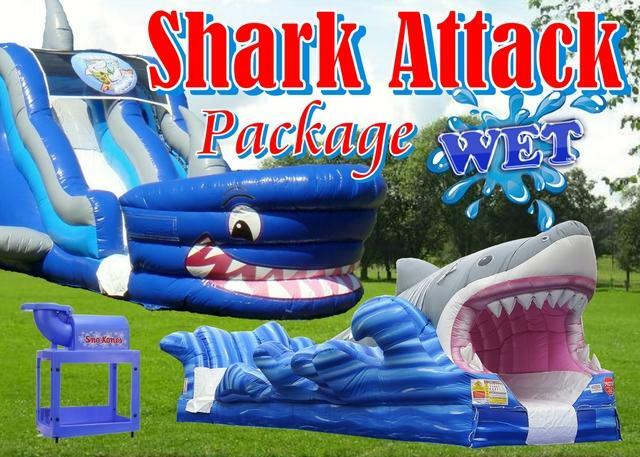 When you rent this unit YOU MUST PROVIDE A HOSE LONG ENOUGH TO REACH WHERE THE INFLATABLES ARE GOING TO BE SET UP. When you reserve this package, you'll be saving $30.00 and will also get FREE setup. LOOK AT THIS VIDEOS TO SEE HOW AWESOME THIS SHARKS ARE!